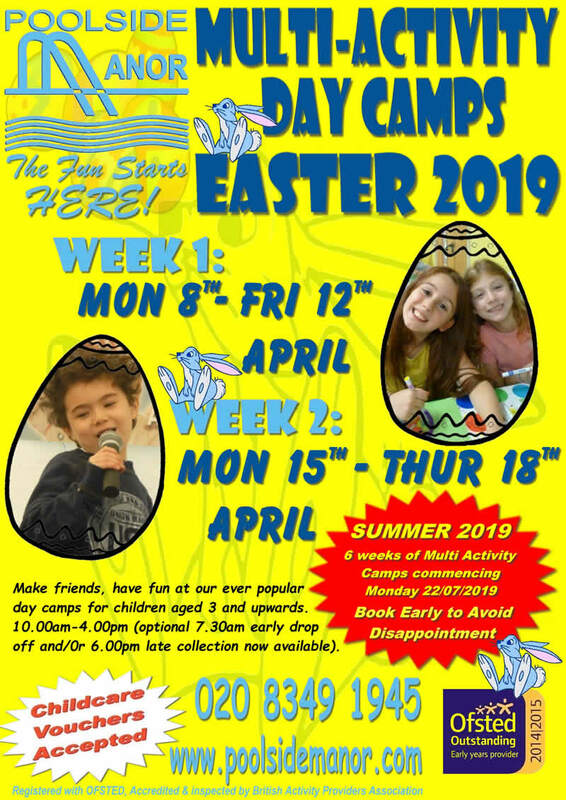 Poolside Manor has a rich history of providing top quality multi-activity holiday camps for children aged 3 and upwards. Camps have been transformed in recent years and continue to expand to other sites, now enjoying the first-class facilities of nearby St. Mary’s Primary School. Our exciting programmes are never the same. Each week is themed differently, to capture imaginations and shape the programme of activities on offer. And when we say multi-activity, we really mean it! Children are served up such a range of sports, craft and art activities, dance, drama, games and visiting performers that they are likely to find new activities every week and every day! Our leaders possess a vast amount of collective talent, experience and expertise. We endeavour to use this to design activities which enable children to develop their skills at the same time as having the times of their lives. Poolside Manor camps are regulated by the British Activity Holiday Association and Ofsted. We are on the Early Year, Childcare and Voluntary Ofsted registers and as a result are subject to the strict license regulations and inspections conducted by them. New clients are given equal priority to existing ones. Our camps are extremely popular and so we strongly recommend that you book well in advance to avoid disappointment! We now offer individual days to children as we know school holidays can cause parents / guardians huge changes to their weekly schedules and who may not need to book a week or even two days. So if you need one day, it is now available. Bookings are only made upon full payment and are non-refundable and non-transferable. We accept all forms of payment except American Express including Child Care vouchers. Please contact us directly to arrange this. Each normal day begins at 10am and lasts until 4pm. We now offer a selection of early starts and late finishes to help parents / guardians with their normal day. These times start from 7.30am until 10am (normal start) and our latest finish is 6pm. For further details, see timetable and pricing (see tabs above) or contact us for more information. Children arrive to settle in, enjoy a tantalising range of free play activities and make new friends. Each child will have a snack and drink ( we cater for most requirements if informed ). Children are engrossed in a thrilling range of activities that are designed to appeal to a broad range of interests and ages. Activities are varied, well resourced and delivered by talented and passionate camp leaders. Sports include football, cricket, tennis, junior golf, hockey, rounders, dodgeball, basketball, netball, table tennis, snooker, pool and team multi-games. A unique array of arts & crafts and dance & drama workshops are offered, with unstoppable creativity when the children and camp leaders work together. Lunchtime serves as a pit stop and chance for children to refuel with their own packed lunch (not provided) and then enjoy a treat from the tuck shop while they watch a DVD in preparation for the afternoon. All attention then turns to the fun that is about to be had in the afternoon. Two activities are staged, one of which is Splash, a thrilling swimming session of team games and free play. The children in their groups enjoy Splash while the other groups enjoy a second afternoon activity, whether arts & crafts, dance & drama or a sporting activity. Groups rotate to experience a full taste of our camp programme. Home time for many, children are collected accompanied by their art work and maybe even prizes for their achievements. We offer the option of extending the day with early starts or late finishes available. Late Finishes - Camp ends at 5.00pm, 5.30pm or 6.00pm instead of 4.00pm. Pick up for all late finishes after 4.00pm will be at Poolside Manor. - Christmas Camp is always based at Poolside Manor. - First and last weeks of Summer Camp may be based at Poolside Manor, but this will be confirmed when booking. Please contact us to discuss extended start and finish times. Please make us aware of allergies your child may have. Packed lunch boxes must be named and must NOT contain nuts or food containing nuts or sesame seeds, chocolate or fizzy drinks. If paying with childcare vouchers please let us know when booking.